The custom Ford Jotto Desk laptop truck mount was engineered for use in the newly designed Ford F150, aluminum body truck, for 2015, 2016, 2017, 2018 & 2019 with bucket seats & OEM console. To help you better understand Jotto Desk laptop truck mounts, we have included links to all the various components and common questions. These links open a small pop-up window with a description, some include pictures and many have a short video clip that will show you how that part of the laptop truck mount works. We encourage you to use these so you can get complete details. Solid 1 Piece Base connects under the seat rail, with No Drilling required! The Tube and Rod, used for vertical height adjustment, is easily adjusted with the use of the Soft Touch Knob and Screw. This will allow the laptop mount to clear the center console in your F150. The Articulating Swing Arm provides horizontal adjustment, so that the laptop can be positioned for comfortable use by either driver or passenger. The laptop holder swing arm, and desk top are locked in position with the use of "Ratchet Handle" tighteners. Your laptop can be attached or detached in seconds, from the desktop, with the use of the patented Cable Dock™ laptop attaching system. This superior holding system can be adjusted to handle any size or type of laptop computer, including tablets. The desktop is made from an extremely rigid and durable plastic polymer, sits on an adjustable swivel point, allowing the Desktop to Swivel 360° and Tilt 320°. Ergonomic comfort while using your Jotto Desk mobile office holder is assured because of it's wide range of adjustability! 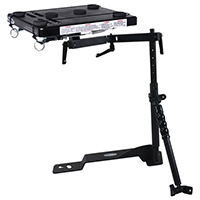 The laptop holder will work equally well if your F150 has buckets or split bench seating. This Jotto Desk laptop truck holder is passenger friendly; leaving plenty of room for a person to sit in the front passenger seat with the laptop holder installed. When no laptop holder is required, the Jotto Desk is easily removed, without tools, in seconds. Click on image for more pictures. Common sense dictates that the vehicles driver or passenger should not attempt to use a laptop in any way while the vehicle is in motion. However, if you intend to travel with the notebook computer open on the holder, for applications such as laptop GPS or passenger entertainment, we do STRONGLY RECOMMEND the purchase of an Accessory Screen Holder which will minimize screen movement and significantly reduce wear and tear on your computer hardware. There are two other things to consider when using a laptop in your F150. Laptop security and power. First, if you intend to leave your laptop in your F150 unattended, we suggest a Kensington Lock to provide security. Secondly, powering your laptop inside your F150 for an extended time, is best achieved with the use of a quality laptop Power Adapter or Inverter. We recommend a pure sine wave inverter, for the best in laptop protection and clean power. Deciding if you need a Power Inverter or a Power Adapter is quite straight forward. If you think you want to have power available for other devices other than your laptop, a power inverter is the choice. If you are going to keep the same brand of laptop and will never need power for any other device, a power adapter is the one to choose. The inverters we sell, like Jotto Desk, are of superior quality and design. To see the Jotto Desk in action, click on the video button below. If you have any questions, call us Toll Free 1-866-314-5427, chat with us during regular business hours, or leave a message after hours using our chat portal, found on the bottom right of your screen. ©2016 Diversified Products USA Inc.